THIS IS NO JOKE....I get refused now on my age...not my capability. Managed however to secure another year with Coarol Nash. Gee Ajays that stinks! ask the broker which companies they checked with and then try other companies or go to the original insurance company that previously covered you and ask them to think again. I got kicked off Bennets the Big One...nobody over 75 and I was with them for years. However, Carole Nash have covered me on a Classic Muti policy with restrictions ie; no pillionn rider and distance annual limit. 1000mls each bike. Yet I'm a safer bet than most these days and at speed. Hey Ho, don't get old. Hey, I came here for humor and left outraged! Ajays--that's terrible. 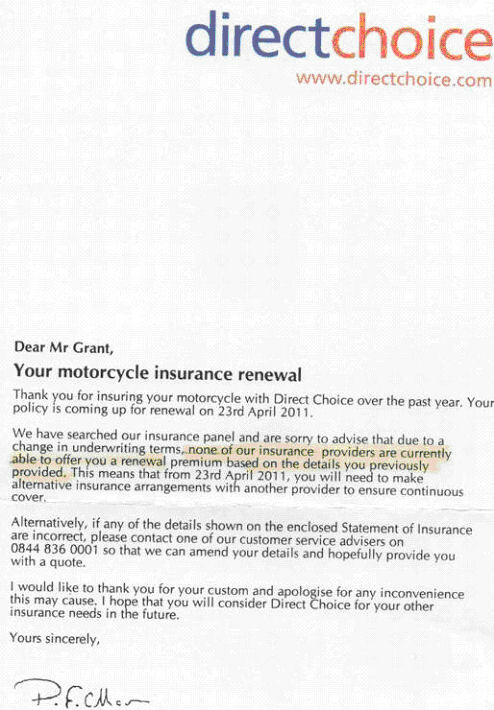 I must confess to total ignorance of English insurance industry, however that does seem unfair--discriminatory. Glad you have found coverage to keep on riding, but I do not understand the limitation on mileage that was placed on your current policy. Perhaps zero annual mileage would make the insurance company more comfortable. . . I hope that when you next ride by the corporate office building of your old insurer, you are able to extend the proper gesture in their direction (with your left hand, of course.) I believe in England that gesture is a variation of the "victory" sign . . .